A smooth melt in your mouth chocolate mousse. Allow tofu to reach room temperature. Sit over a pan of simmering water (a bain marie) and allow the chocolate to melt, stirring occasionally. Allow to cool. In a food mixer add the tofu, maple syrup, and cocoa powder and blend until smooth. Pour the mixture into a bowl and fold* in the melted chocolate evenly using a spatula. Scoop the mixture into small serving dishes. Decorate with finely grated chocolate and mint leaves. 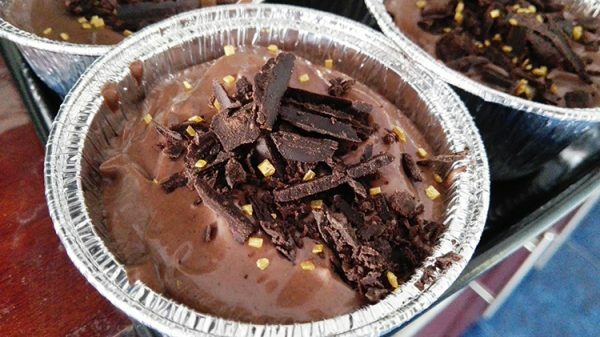 Enjoy the tasty silken tofu chocolate mousse. * A method of gently mixing ingredients-usually delicate or whipped ingredients that cannot withstand stirring or beating. To fold, use a rubber spatula to cut down through the mixture, move across the bottom of the bowl, and come back up, folding some of the mixture from the bottom over close to the surface.